I think I’ve gotten to a point where I’m pretty confident in my baking abilities, but I’m starting to realize that my cooking skills have been lacking. I don’t really have any cooking instincts and that concerns me a bit. As I was thinking about the next dessert I was going to make for this blog, Mike offered his two cents– “Does it have to be a dessert? I’m kinda hungry.” I have to admit, I like cooking, but my cooking instincts are a bit off. I know Mike would love nothing more than a few traditional Vietnamese dishes a week, but at this point I’m a bit incapable. Asian spices and sauces just don’t register with me. So with a promise to delve into some of childhood dishes as a later time, I did however agree to make something we could take to work the next day. So, after looking around in our pantry and taking a look at our fridge, it’s pasta time. Sitting on my counter: Rotelli pasta, mozzarella, Parmesan, butter, spinach, and basil. So…what to do. I didn’t want to just throw these in spaghetti sauce. Not really blog worthy…and then a bell went off. 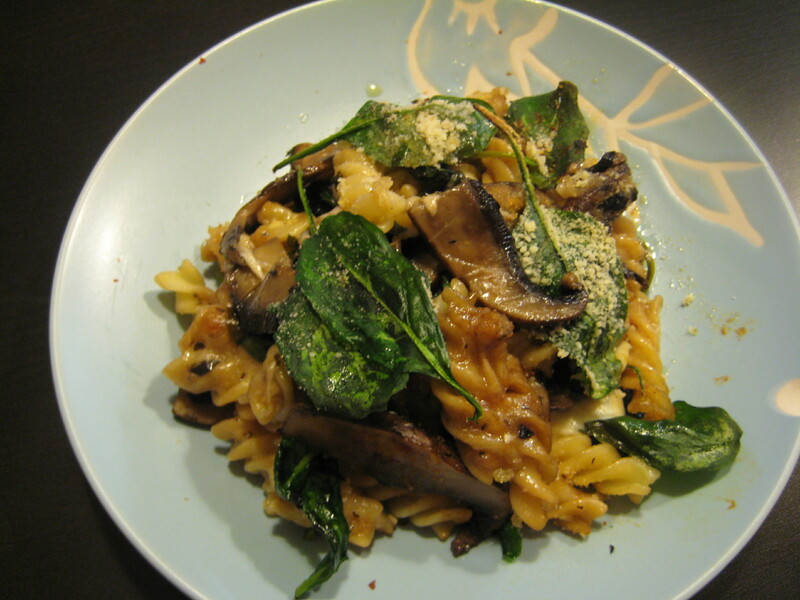 Mike’s cousin made a great vegetarian pasta casserole at holiday get together last year using similar ingredients. I was missing some fresh basil, but I was far too lazy to head to the grocery store so dried basil would have to do. Either way, this casserole is just delicious! The whole idea behind this dish is very versatile–if it had been earlier in the night, I would have made a dash for Trader Joe’s. I will say one thing–this recipe contains soy sauce. I know, soy sauce. I winced a bit when she told me that was one of her key ingredients…soy sauce and mozzarella or pasta? I just don’t know…but, having tasted the pasta, I will vouch for it. It just adds a great layer of flavor, and I guarantee you, that know one will ever guess that there’s soy sauce in the dish. ***Next time I make this dish, I think I’ll try a combination of asparagus and pancetta! I’m thinking I’ll in all likelihood cut down or omit the soy sauce all together. Pancetta is so wonderfully rich and salty, I think soy sauce may over power it. 1/2 teaspoon dried basil (or 4-5 leaves of fresh basil, sliced) *IF using dried basil, toss in with garlic and butter in the beginning of recipe. If using fresh, follow instructions below. Preheat oven to 350 degrees F (175 degrees C). In a bowl, combine bread crumbs and Parmesan. Set aside. Lightly grease a 9×13 inch baking dish. Bring a large pot of lightly salted water to a boil. Place pasta in the pot, cook for 8 to 10 minutes, until al dente, and drain. Heat the oil in a large saucepan over medium heat. Stir in the mushrooms, cook 1 minute, and set aside. Melt butter in the saucepan. Mix in flour and garlic. Gradually mix in milk until thickened. Stir in 1 cup cheese until melted. Add soy sauce and mix thoroughly (that way you don’t get patches of pasta that has too much of a soy sauce) . 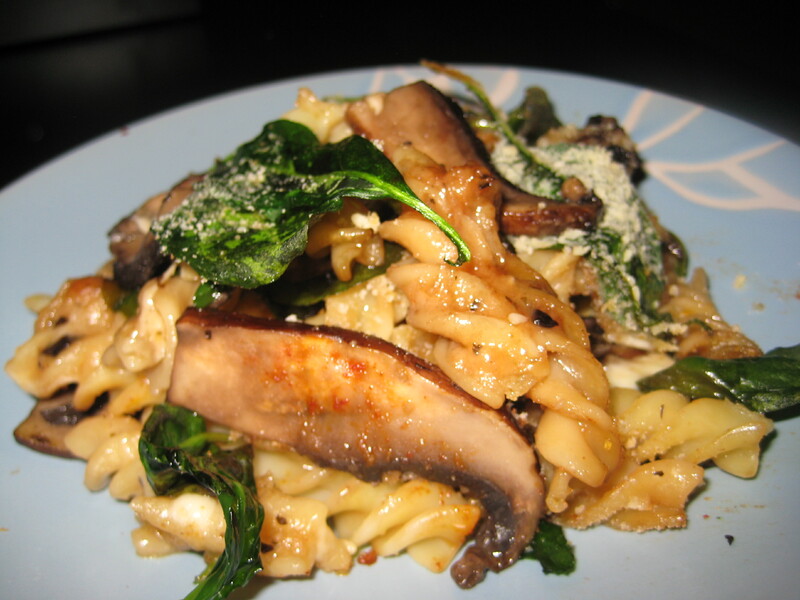 Remove saucepan from heat, and mix in cooked pasta, mushrooms, basil, spinach and remaining mozzarella. Transfer to the prepared baking dish. Top pasta with Parmesan/Bread crumb mixture. Bake 20 minutes in the preheated oven, until bubbly and lightly brown.